Territory of the Xiongnu which includes Mongolia, Western Manchuria, Xinjiang, East Kazakhstan, East Kyrgyzstan, Northern China and Gansu. Wade–Giles, sometimes abbreviated Wade, is a romanization system for Mandarin Chinese. It developed from a system produced by Thomas Wade, during the mid-19th century, and was given completed form with Herbert A. Giles's Chinese–English Dictionary of 1892. 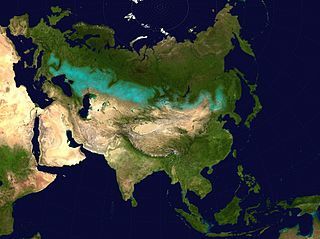 After their previous overlords, the Yuezhi, migrated into Central Asia during the 2nd century BC, the Xiongnu became a dominant power on the steppes of north-east Central Asia, centred on an area known later as Mongolia. The Xiongnu were also active in areas now part of Siberia, Inner Mongolia, Gansu and Xinjiang. Their relations with adjacent Chinese dynasties to the south east were complex, with repeated periods of conflict and intrigue, alternating with exchanges of tribute, trade, and marriage treaties. The Yuezhi were an ancient Indo-European people first described in Chinese histories as nomadic pastoralists living in an arid grassland area in the western part of the modern Chinese province of Gansu, during the 1st millennium BC. After a major defeat by the Xiongnu in 176 BC, the Yuezhi split into two groups migrating in different directions: the Greater Yuezhi and Lesser Yuezhi. During the Sixteen Kingdoms era, they were known as one of the Five Barbarians. The Sixteen Kingdoms, less commonly the Sixteen States, was a chaotic period in Chinese history from AD 304 to 439, when the political order of northern China fractured into a series of short-lived sovereign states, most of which were founded by the "Five Barbarians," ethnic minority peoples who had settled in northern China during the preceding centuries and participated in the overthrow of the Western Jin dynasty in the early 4th century. The kingdoms founded by ethnic Xiongnu, Xianbei, Di, Jie, Qiang, as well as Han Chinese and other ethnicities, fought against each other and the Eastern Jin dynasty, which succeeded the Western Jin and ruled southern China. The period ended with the unification of northern China in the early 5th century by the Northern Wei, a dynasty that evolved from a kingdom founded by ethnic Xianbei. The Five Barbarians, or Wu Hu, is a Chinese historical exonym for ancient non-Chinese peoples who immigrated to northern China in the Eastern Han dynasty, and then overthrew the Western Jin dynasty and established their own kingdoms in the 4th–5th centuries. The peoples categorized as the Five Barbarians were the Xiongnu, Jie, Xianbei, Di, and Qiang. Of these five tribal ethnic groups, the Xiongnu and Xianbei were nomadic peoples from the northern steppes. The ethnic identity of the Xiongnu is uncertain, but the Xianbei appear to have been Mongolic. The Jie, another pastoral people, may have been a branch of the Xiongnu, who may have been Yeniseian. The Di and Qiang were from the highlands of western China. The Qiang were predominantly herdsmen and spoke Sino-Tibetan (Tibeto-Burman) languages, while the Di were farmers who may have spoken a Sino-Tibetan or Turkic language. 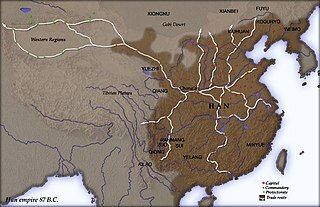 The Han dynasty was the second imperial dynasty of China, preceded by the Qin dynasty and succeeded by the Three Kingdoms period. Spanning over four centuries, the Han period is considered a golden age in Chinese history. To this day, China's majority ethnic group refers to themselves as the "Han Chinese" and the Chinese script is referred to as "Han characters". It was founded by the rebel leader Liu Bang, known posthumously as Emperor Gaozu of Han, and briefly interrupted by the Xin dynasty of the former regent Wang Mang. This interregnum separates the Han dynasty into two periods: the Western Han or Former Han and the Eastern Han or Later Han (25–220 AD). Sima Qian was a Chinese historian of the early Han dynasty. He is considered the father of Chinese historiography for his Records of the Grand Historian, a Jizhuanti-style general history of China, covering more than two thousand years from the Yellow Emperor to his time, during the reign of Emperor Wu of Han, a work that had much influence for centuries afterwards on history-writing not only in China, but in Korea, Japan and Vietnam as well. Although he worked as the Court Astrologer, later generations refer to him as the Grand Historian for his monumental work; a work which in later generations would often only be somewhat tacitly or glancingly acknowledged as an achievement only made possible by his acceptance and endurance of punitive actions against him, including imprisonment, castration, and subjection to servility. The Xianyun was an ancient nomadic tribe that invaded China during the Zhou Dynasty. This Chinese exonym is written with xian 獫 or 玁 "long-snouted dog", and this "dog" radical 犭 is commonly used in graphic pejorative characters. 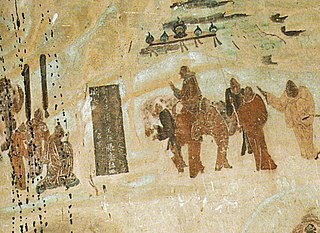 Scholars identify the Xianyun with the Quanrong and Xiongnu. Xirong or Rong were various people who lived primarily in and around the extremities of ancient China known as early as the Shang dynasty. They were typically to the west of the later Zhou state from the Zhou Dynasty onwards. They were mentioned in some ancient Chinese texts as perhaps related to the people of the Chinese civilization. 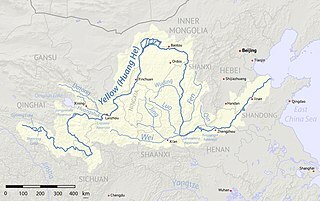 The Shang dynasty or Yin dynasty, according to traditional historiography, ruled in the Yellow River valley in the second millennium BC, succeeding the Xia dynasty and followed by the Zhou dynasty. The classic account of the Shang comes from texts such as the Book of Documents, Bamboo Annals and Records of the Grand Historian. According to the traditional chronology based on calculations made approximately 2,000 years ago by Liu Xin, the Shang ruled from 1766 to 1122 BC, but according to the chronology based upon the "current text" of Bamboo Annals, they ruled from 1556 to 1046 BC. The Xia–Shang–Zhou Chronology Project dated them from c. 1600 to 1046 BC. After forging internal unity, Modu Chanyu expanded the empire on all sides. To the north he conquered a number of nomadic peoples, including the Dingling of southern Siberia. He crushed the power of the Donghu people of eastern Mongolia and Manchuria as well as the Yuezhi in the Hexi Corridor of Gansu, where his son, Jizhu, made a skull cup out of the Yuezhi king. Modu also reoccupied all the lands previously taken by the Qin general Meng Tian. Yap,  apparently describing the early period, places the Chanyu's main camp north of Shanxi with the Tuqi King of the Left holding the area north of Beijing and the Tuqi King of the Right holding the Ordos Loop area as far as Gansu. Grousset,  probably describing the situation after the Xiongnu had been driven north, places the Chanyu on the upper Orkhon River near where Genghis Khan would later establish his capital of Karakorum. The Tuqi King of the Left lived in the east, probably on the high Kherlen River. The Tuqi King of the Right lived in the west, perhaps near present-day Uliastai in the Khangai Mountains. In the winter of 200 BC, following a Xongnu siege of Taiyuan, Emperor Gaozu of Han personally led a military campaign against Modu Chanyu. At the Battle of Baideng, he was ambushed reputedly by Xiongnu cavalry. The emperor was cut off from supplies and reinforcements for seven days, only narrowly escaping capture. The Han sent princesses to marry Xiongnu leaders in their efforts to stop the border raids. Along with arranged marriages, the Han sent gifts to bribe the Xiongnu to stop attacking. After the defeat at Pingcheng in 200 BC, the Han emperor abandoned a military solution to the Xiongnu threat. Instead, in 198 BC, the courtier Liu Jing [ zh ] was dispatched for negotiations. 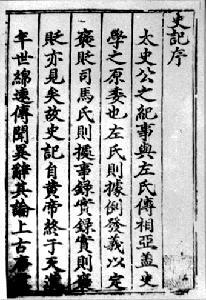 The peace settlement eventually reached between the parties included a Han princess given in marriage to the chanyu (called heqin ) (Chinese :和親; literally: 'harmonious kinship'); periodic gifts to the Xiongnu of silk, distilled beverages and rice; equal status between the states; and the Great Wall as mutual border. This first treaty set the pattern for relations between the Han and the Xiongnu for sixty years. Up to 135 BC, the treaty was renewed nine times, each time with an increase in the "gifts" to the Xiongnu Empire. In 192 BC, Modun even asked for the hand of Emperor Gaozu of Han widow Empress Lü Zhi. His son and successor, the energetic Jiyu, known as the Laoshang Chanyu, continued his father's expansionist policies. Laoshang succeeded in negotiating with Emperor Wen terms for the maintenance of a large scale government sponsored market system. 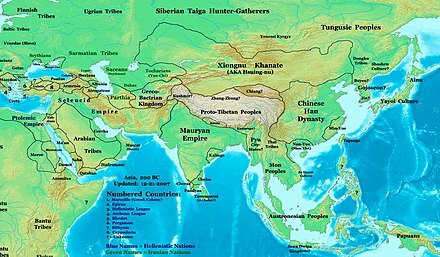 The Han dynasty world order in AD 2. The Han dynasty made preparations for war when the Han Emperor Wu dispatched the explorer Zhang Qian to explore the mysterious kingdoms to the west and to form an alliance with the Yuezhi people in order to combat the Xiongnu. During this time Zhang married a Xiongnu wife, who bore him a son, and gained the trust of the Xiongnu leader. While Zhang Qian did not succeed in this mission,  his reports of the west provided even greater incentive to counter the Xiongnu hold on westward routes out of China, and the Chinese prepared to mount a large scale attack using the Northern Silk Road to move men and material. While Han China was making preparations for a military confrontation since the reign of Emperor Wen, the break did not come until 133 BC, following an abortive trap to ambush the chanyu at Mayi. By that point the empire was consolidated politically, militarily and economically, and was led by an adventurous pro-war faction at court. In that year, Emperor Wu reversed the decision he had made the year before to renew the peace treaty. Full-scale war broke out in autumn 129 BC, when 40,000 Chinese cavalry made a surprise attack on the Xiongnu at the border markets. In 127 BC, the Han general Wei Qing retook the Ordos. In 121 BC, the Xiongnu suffered another setback when Huo Qubing led a force of light cavalry westward out of Longxi and within six days fought his way through five Xiongnu kingdoms. The Xiongnu Hunye king was forced to surrender with 40,000 men. In 119 BC both Huo and Wei, each leading 50,000 cavalrymen and 100,000 footsoldiers (in order to keep up with the mobility of the Xiongnu, many of the non-cavalry Han soldiers were mobile infantrymen who traveled on horseback but fought on foot), and advancing along different routes, forced the chanyu and his Xiongnu court to flee north of the Gobi Desert. [ page needed ] Major logistical difficulties limited the duration and long-term continuation of these campaigns. According to the analysis of Yan You (嚴尤), the difficulties were twofold. Firstly there was the problem of supplying food across long distances. Secondly, the weather in the northern Xiongnu lands was difficult for Han soldiers, who could never carry enough fuel. [note 1] According to official reports, the Xiongnu lost 80,000 to 90,000 men, and out of the 140,000 horses the Han forces had brought into the desert, fewer than 30,000 returned to China. When a Chanyu died, power could pass to his younger brother if his son was not of age. This system, which can be compared to Gaelic tanistry, normally kept an adult male on the throne, but could cause trouble in later generations when there were several lineages that might claim the throne. When the 12th Chanyu died in 60 BC, power was taken by Woyanqudi, a grandson of the 12th Chanyu's cousin. Being something of a usurper, he tried to put his own men in power, which only increased the number of his enemies. The 12th Chanyu's son fled east and, in 58 BC, revolted. Few would support Woyanqudi and he was driven to suicide, leaving the rebel son, Huhanye, as the 14th Chanyu. The Woyanqudi faction then set up his brother, Tuqi, as Chanyu (58 BC). In 57 BC three more men declared themselves Chanyu. Two dropped their claims in favor of the third who was defeated by Tuqi in that year and surrendered to Huhanye the following year. In 56 BC Tuqi was defeated by Huhanye and committed suicide, but two more claimants appeared: Runzhen and Huhanye's elder brother Zhizhi Chanyu. Runzhen was killed by Zhizhi in 54 BC, leaving only Zhizhi and Huhanye. Zhizhi grew in power, and, in 53 BC, Huhanye moved south and submitted to the Chinese. Huhanye used Chinese support to weaken Zhizhi, who gradually moved west. In 49 BC, a brother to Tuqi set himself up as Chanyu and was killed by Zhizhi. In 36 BC, Zhizhi was killed by a Chinese army while trying to establish a new kingdom in the far west near Lake Balkhash. In 53 BC Huhanye (呼韓邪) decided to enter into tributary relations with Han China. The original terms insisted on by the Han court were that, first, the chanyu or his representatives should come to the capital to pay homage; secondly, the chanyu should send a hostage prince; and thirdly, the chanyu should present tribute to the Han emperor. The political status of the Xiongnu in the Chinese world order was reduced from that of a "brotherly state" to that of an "outer vassal" (外臣). During this period, however, the Xiongnu maintained political sovereignty and full territorial integrity. The Great Wall of China continued to serve as the line of demarcation between Han and Xiongnu. Huhanye sent his son, the "wise king of the right" Shuloujutang, to the Han court as hostage. In 51 BC he personally visited Chang'an to pay homage to the emperor on the Lunar New Year. In the same year, another envoy Qijushan (稽居狦) was received at the Sweet Spring Palace in the north west of modern Shanxi. On the financial side, Huhanye was amply rewarded in large quantities of gold, cash, clothes, silk, horses and grain for his participation. Huhanye made two further homage trips, in 49 BC and 33 BC; with each one the imperial gifts were increased. On the last trip, Huhanye took the opportunity to ask to be allowed to become an imperial son-in-law. As a sign of the decline in the political status of the Xiongnu, Emperor Yuan refused, giving him instead five ladies-in-waiting. One of them was Wang Zhaojun, famed in Chinese folklore as one of the Four Beauties. When Zhizhi learned of his brother's submission, he also sent a son to the Han court as hostage in 53 BC. Then twice, in 51 BC and 50 BC, he sent envoys to the Han court with tribute. But having failed to pay homage personally, he was never admitted to the tributary system. In 36 BC, a junior officer named Chen Tang, with the help of Gan Yanshou, protector-general of the Western Regions, assembled an expeditionary force that defeated him at the Battle of Zhizhi and sent his head as a trophy to Chang'an. 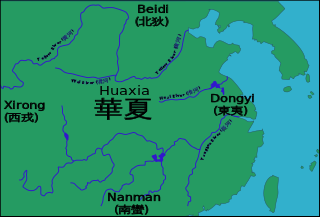 Tributary relations were discontinued during the reign of Huduershi (18 AD–48), corresponding to the political upheavals of the Xin Dynasty in China. The Xiongnu took the opportunity to regain control of the western regions, as well as neighbouring peoples such as the Wuhuan. In 24 AD, Hudershi even talked about reversing the tributary system. The Xiongnu's new power was met with a policy of appeasement by Emperor Guangwu. At the height of his power, Huduershi even compared himself to his illustrious ancestor, Modu. Due to growing regionalism among the Xiongnu, however, Huduershi was never able to establish unquestioned authority. In contravention of a principle of fraternal succession established by Huhanye, Huduershi designated his son Punu as heir-apparent. However, as the eldest son of the preceding chanyu, Bi (Pi) – the Rizhu King of the Right – had a more legitimate claim. Consequently, Bi refused to attend the annual meeting at the chanyu's court. Nevertheless, in 46 AD, Punu ascended the throne. In 48 AD, a confederation of eight Xiongnu tribes in Bi's power base in the south, with a military force totalling 40,000 to 50,000 men, seceded from Punu's kingdom and acclaimed Bi as chanyu. This kingdom became known as the Southern Xiongnu. The rump kingdom under Punu, around the Orkhon (modern north central Mongolia) became known as the Northern Xiongnu. Punu, who became known as the Northern Chanyu, began to put military pressure on the Southern Xiongnu. In 49 AD, Tsi Yung, a Han governor of Liaodong, allied with the Wuhuan and Xianbei, attacked the Northern Xiongnu. The Northern Xiongnu suffered two major defeats: one at the hands of the Xianbei in 85 AD, and by the Han during the Battle of Ikh Bayan, in 89 AD. The northern chanyu fled to the north-west with his subjects. Coincidentally, the Southern Xiongnu were plagued by natural disasters and misfortunes – in addition to the threat posed by Punu. Consequently, in 50 AD, the Southern Xiongnu submitted to tributary relations with Han China. The system of tribute was considerably tightened by the Han, to keep the Southern Xiongnu under control. The chanyu was ordered to establish his court in the Meiji district of Xihe commandery and the Southern Xiongnu were resettled in eight frontier commanderies. At the same time, large numbers of Chinese were also resettled in these commanderies, in mixed Han-Xiongnu settlements. Economically, the Southern Xiongnu became reliant on trade with the Han. Tensions were evident between Han settlers and practitioners of the nomadic way of life. Thus, in 94, Anguo Chanyu joined forces with newly subjugated Xiongnu from the north and started a large scale rebellion against the Han. During the late 2nd century AD, the southern Xiongnu were drawn into the rebellions then plaguing the Han court. In 188, the chanyu was murdered by some of his own subjects for agreeing to send troops to help the Han suppress a rebellion in Hebei – many of the Xiongnu feared that it would set a precedent for unending military service to the Han court. The murdered chanyu's son Yufuluo, entitled Chizhisizhu (持至尸逐侯), succeeded him, but was then overthrown by the same rebellious faction in 189. He travelled to Luoyang (the Han capital) to seek aid from the Han court, but at this time the Han court was in disorder from the clash between Grand General He Jin and the eunuchs, and the intervention of the warlord Dong Zhuo. The chanyu had no choice but to settle down with his followers in Pingyang, a city in Shanxi. In 195, he died and was succeeded as chanyu by his brother Huchuquan Chanyu. In 215–216 AD, the warlord-statesman Cao Cao detained Huchuquan Chanyu in the city of Ye, and divided his followers in Shanxi into five divisions: left, right, south, north, and centre. This was aimed at preventing the exiled Xiongnu in Shanxi from engaging in rebellion, and also allowed Cao Cao to use the Xiongnu as auxiliaries in his cavalry. In 304, Liu Yuan became Chanyu of the Five Hordes. In 308, declared himself emperor and founded the Han Zhao Dynasty. In 311, his son and successor Liu Cong captured Luoyang, and with it the Emperor Huai of Jin China. In 316, the Emperor Min of Jin China was captured in Chang'an. Both emperors were humiliated as cupbearers in Linfen before being executed in 313 and 318. In 318, after suppressing a coup by a powerful minister in the Xiongnu-Han court, in which the emperor and a large proportion of the aristocracy were massacred), the Xiongnu prince Liu Yao moved the Xiongnu-Han capital from Pingyang to Chang'an and renamed the dynasty as Zhao (Liu Yuan had declared the empire's name Han to create a linkage with Han Dynasty—to which he claimed he was a descendant, through a princess, but Liu Yao felt that it was time to end the linkage with Han and explicitly restore the linkage to the great Xiongnu chanyu Maodun, and therefore decided to change the name of the state. (However, this was not a break from Liu Yuan, as he continued to honor Liu Yuan and Liu Cong posthumously; it is hence known to historians collectively as Han Zhao). However, the "Liu" Xiongnu remained active in the north for at least another century. The northern Tiefu branch of the Xiongnu gained control of the Inner Mongolian region in the 10 years between the conquest of the Tuoba Xianbei state of Dai by the Former Qin empire in 376, and its restoration in 386 as the Northern Wei. After 386, the Tiefu were gradually destroyed by or surrendered to the Tuoba, with the submitting Tiefu becoming known as the Dugu. Liu Bobo, a surviving prince of the Tiefu fled to the Ordos Loop, where he founded a state called the Xia (thus named because of the Xiongnu's supposed ancestry from the Xia dynasty) and changed his surname to Helian (赫連). The Helian-Xia state was conquered by the Northern Wei in 428–31, and the Xiongnu thenceforth effectively ceased to play a major role in Chinese history, assimilating into the Xianbei and Han ethnicities. Tongwancheng (meaning "Unite All Nations") was the capital of the Xia (Sixteen Kingdoms), whose rulers claimed descent from Modu Chanyu. The Juqu were a branch of the Xiongnu. Their leader Juqu Mengxun took over the Northern Liang by overthrowing the former puppet ruler Duan Ye. By 439, the Juqu power was destroyed by the Northern Wei. Their remnants were then settled in the city of Gaochang before being destroyed by the Rouran. Barfield  attempted to interpret Xiongnu history as well as narrate it. He made the following points: The Xiongnu confederation was unusually long-lived for a steppe empire. The purpose of raiding China was not simply for goods, but to force the Chinese to pay regular tribute. The power of the Xiongnu ruler was based on his control of Chinese tribute which he used to reward his supporters. The Han and Xiongnu empires rose at the same time because the Xiongnu state depended on Chinese tribute. A major Xiongnu weakness was the custom of lateral succession. If a dead ruler's son was not old enough to take command, power passed to the late ruler's brother. This worked in the first generation but could lead to civil war in the second generation. The first time this happened, in 60 BC, the weaker party adopted what Barfield calls the 'inner frontier strategy.' They moved south and submitted to China and then used Chinese resources to defeat the Northern Xiongnu and re-establish the empire. The second time this happened, about 47 AD, the strategy failed. The southern ruler was unable to defeat the northern ruler and the Xiongnu remained divided. 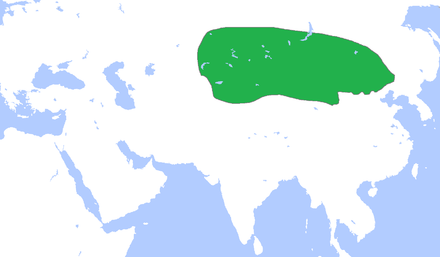 Location of Xiongnu and other steppe nations in 300 AD. The sound of the first Chinese character (匈) has been reconstructed as /qʰoŋ/ in Old Chinese. The Chinese name for the Xiongnu was a pejorative term in itself, as the characters have the meaning of "fierce slave". The Chinese characters are pronounced as Xiōngnú [ɕjʊ́ŋnǔ] in modern Mandarin Chinese. The supposed Old Chinese sound of the first character (匈) has a possible similarity with the name "Hun" in European languages. The second character (奴) appears to have no parallel in Western terminology. Whether the similarity is evidence of kinship or mere coincidence is hard to tell. It could lend credence to the theory that the Huns were in fact descendants of the Northern Xiongnu who migrated westward, or that the Huns were using a name borrowed from the Northern Xiongnu, or that these Xiongnu made up part of the Hun confederation. The Xiongnu-Hun hypothesis originated with the 18th-century French historian Joseph de Guignes, who noticed that ancient Chinese scholars had referred to members of tribes associated with the Xiongnu by names similar to "Hun", albeit with varying Chinese characters. Étienne de la Vaissière has shown that, in the Sogdian script used in the so-called "Sogdian Ancient Letters", both the Xiongnu and Huns were referred to as γwn (xwn), indicating that the two were synonymous. Although the theory that the Xiongnu were precursors of the Huns known later in Europe is now accepted by many scholars, it has yet to become a consensus view. The identification with the Huns may be either incorrect or an oversimplification (as would appear to be the case with a proto-Mongol people, the Rouran, who have sometimes been linked to the Avars of Central Europe). Bronze plaque of a man of the Ordos Plateau, long held by the Xiongnu. 3–1st century BCE. British Museum. Otto J. Maenchen-Helfen notes that the statuette displays Caucasoid features. In the 1920s, Pyotr Kozlov's excavations of the royal tombs at the Noin-Ula burial site in northern Mongolia that date to around the first century CE provided a glimpse into the lost world of the Xiongnu. Other archaeological sites have been unearthed in Inner Mongolia and elsewhere; they represent the Neolithic and historical periods of the Xiongnu's history. Those included the Ordos culture, many of them had been identified as the Xiongnu cultures. The region was occupied predominantly by peoples showing Caucasoid features, known from their skeletal remains and artifacts   . In a paper (Lihongjie 2012), the author analyzed the Y-DNAs of the ancient male samples from the 2nd or 1st century BCE cemetery at Heigouliang in Xinjiang – which is also believed to be the site of a summer palace for Xiongnu kings – which is east of the Barkol basin and near the city of Hami. The Y-DNA of 12 men excavated from the site belonged to Q-MEH2 (Q1a) or Q-M378 (Q1b). The Q-M378 men among them were regarded as hosts of the tombs; half of the Q-MEH2 men appeared to be hosts and the other half as sacrificial victims. Within the Xiongnu culture more variety is visible from site to site than from "era" to "era," in terms of the Chinese chronology, yet all form a whole that is distinct from that of the Han and other peoples of the non-Chinese north. In some instances iconography can not be used as the main cultural identifier because art depicting animal predation is common among the steppe peoples. An example of animal predation associated with Xiongnu culture is a tiger carrying dead prey. We see a similar image in work from Maoqinggou, a site which is presumed to have been under Xiongnu political control but is still clearly non-Xiongnu. From Maoqinggou, we see the prey replaced by an extension of the tiger's foot. The work also depicts a lower level of execution; Maoqinggou work was executed in a rounder, less detailed style. 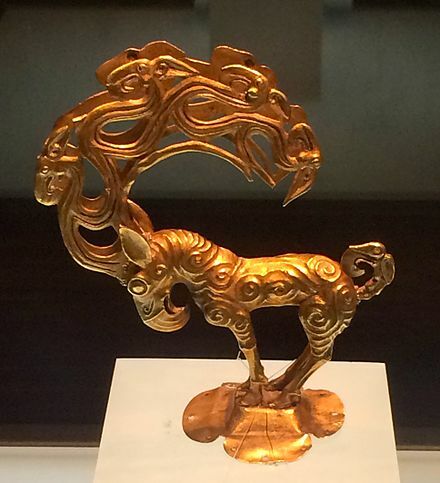 In its broadest sense, Xiongnu iconography of animal predation include examples such as the gold headdress from Aluchaideng and gold earrings with a turquoise and jade inlay discovered in Xigouban, Inner Mongolia. The gold headdress can be viewed, along with some other examples of Xiongnu art, from the external links at the bottom of this article. The Records of the Grand Historian (vol. 110) state that when the Xiongnu noted down something or transmitted a message, they made cuts on a piece of wood; they also mention a "Hu script". Xiongnu were a nomadic people. From their lifestyle of herding flocks and their horse-trade with China, we can conclude that their diet consist mainly of mutton, horse meat and wild geese that were shot down. ↑ This view was put forward to Wang Mang in AD 14  . 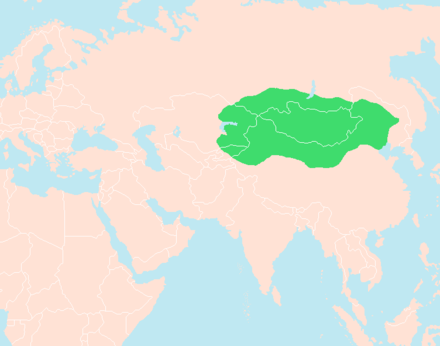 The Rouran Khaganate, Ruanruan, Ruru, or Tantan was the name of a state of uncertain origin, from the late 4th century until the middle 6th century. The Han Zhao, or Former Zhao, or Northern Han (北漢), was a Southern Xiongnu state during Sixteen Kingdoms period coeval with the Chinese Jin Dynasty (265-420). In the Chinese historiography it was given two conditional state titles, the Han state for the state proclaimed in 304 by Liu Yuan, and the Former Zhao state for the state proclaimed in 319 by Liu Yao. The reference to them as separate states should be considered clearly erroneous, given that when Liu Yao changed the name of the state from Han to Zhao in 319, he treated the state as having been continuous from the time that Liu Yuan founded it in 304; instead, he de-established royal lineage to the Han Dynasty and claimed ancestry directly from Yu the Great of the Xia Dynasty. Heqin, also known as marriage alliance, refers to the historical practice of Chinese emperors marrying princesses—usually members of minor branches of the royal family—to rulers of neighboring states. It was often adopted as an appeasement strategy with an enemy state that was too powerful to defeat on the battlefield. The policy was not always effective. It implied an equal diplomatic status between the Chinese emperor and the foreign ruler. As a result, it was controversial and had many critics. The Battle of Baideng (白登之戰) was a military conflict between Han China and the Xiongnu in 200 BC. Han Dynasty of China invaded the territory of the Xiongnu in 200 BC attempting to subjugate them. However the Xiongnu united their forces under Modu Shanyu and surrounded the Han emperor Gaozu in Baideng. The siege was only relieved after seven days when the Han royal court, under Chen Ping's suggestion, sent spies to bribe Modu's wife. The Wuhuan were a Proto-Mongolic nomadic people who inhabited northern China, in what is now the provinces of Hebei, Liaoning, Shanxi, the municipality of Beijing and the autonomous region of Inner Mongolia. Huchuquan was the last chanyu of the Southern Xiongnu during the late Eastern Han dynasty and Three Kingdoms period of China. He was a younger brother of the Xiongnu chanyu in exile, Yufuluo. The Battle of Mobei was a military campaign fought in the northern part of the Gobi Desert. It was part of a major strategic offensive launched by the Han Dynasty in January, 119 BC, into the heartland of the nomadic Xiongnu. The battle was a success for the Han, whose forces were led by Wei Qing and Huo Qubing. The Han–Xiongnu War, also known as the Sino-Xiongnu War, was a series of military conflicts between the Chinese Han dynasty and the Xiongnu confederation from 133 BC to 89 AD. Under Emperor Wu of Han's reign, the Han dynasty switched from a relatively passive foreign policy focused on appeasement to an aggressive expansionist strategy to deal with the increasing Xiongnu incursions on the northern frontier. In 133 BC, the conflict escalated to a full-scale war when the Xiongnu realized that the Han were about to ambush them at Mayi. The Han court decided to deploy several military expeditions toward the regions situated in the Ordos Loop, Hexi Corridor, and Gobi Desert and successfully expelled the Xiongnu. The Tuqi King was a high office of the Xiongnu, a title also known to the Chinese as "worthy/wise prince/king". In the 6-8th centuries, Chinese annalists used the expression 贤王 Xian wang only in reference to the Eastern Turkic Khaganate. Modu, Modun, or Maodun was the son of Touman and the founder of the empire of the Xiongnu. He came to power by ordering his men to kill his father in 209 BCE. The Noin-Ula burial site consist of more than 200 large burial mounds, approximately square in plan, some 2 m in height, covering timber burial chambers. They are located by the Selenga River in the hills of northern Mongolia north of Ulan Bator in Batsumber sum of Tov Province. They were excavated in 1924–1925 by Pyotr Kozlov, who found them to be the tombs of the aristocracy of the Xiongnu; one is an exceptionally rich burial of a historically known ruler of the Xiongnu, Uchjulü-Jodi-Chanuy, who died in 13 CE. Most of the objects from Noin-Ula are now in the Hermitage Museum, while some artifacts unearthed later by Mongolian archaeologists are on display in the National Museum of Mongolian History, Ulan Bator. Two kurgans contained lacquer cups, inscribed with Chinese characters believed to be the names of Chinese craftsmen, and dated September 5 year of Tsian-ping era, i.e. 2nd year BCE. The Ordos Plateau or the Ordos is the land enclosed by the Ordos Loop, a large rectangular bend of the Yellow River in northern China. The Great Wall of China cuts across the center, roughly separating the sparsely populated north—considered the Ordos proper—from the agricultural south, known as the Loess Plateau. The Wei River valley, which cuts horizontally across the south of the loop, was one of the cradles of Chinese civilization and remains densely populated, including Xi'an, which long served as the capital of China. The Ordos Desert in the north is administered by Inner Mongolia. Yizhixie was the brother of Junchen Chanyu and his successor to the Xiongnu throne. Yizhixie ruled during a time of conflict with the southern Han dynasty under the military expansionist, Emperor Wu of Han. Qiangqu was head of the maternal Qiang (Kiyan) tribe, Western Tuqi Prince, successor to Huzheng, and chanyu of the Southern Xiongnu from 179 to 188 AD. Huhanye, born Jihoushan, a Chanyu of the Xiongnu Empire, the son of Xulüquanqu Chanyu. He rebelled in 59 BC with the aid of Wushanmu and Woyanqudi Chanyu soon committed suicide, leaving the Xiongnu torn apart by factional strife. By 55 BC, only Huhanye and his brother Zhizhi Chanyu were left. Huhanye was defeated by Zhizhi in 51 BC and fled to the Han dynasty. Zhizhi also submitted to the Han the following year but declared independence in 48 BC once he saw that they favored his brother. Zhizhi moved further west to attacked Fergana and the Wusun. In 43 BC, Huhanye moved back north. Zhizhi was killed by the Han at the Battle of Zhizhi in 36 BC, leaving Huhanye the uncontested leader of the Xiongnu. Huhanye died in 31 BC and was succeeded by his son Diaotaomogao. ↑ Zheng Zhang (Chinese: 鄭張), Shang-fang (Chinese: 尚芳). 匈 – 字 – 上古音系 – 韻典網. ytenx.org [韻典網]. Rearranged by BYVoid. ↑ Zheng Zhang (Chinese: 鄭張), Shang-fang (Chinese: 尚芳). 奴 – 字 – 上古音系 – 韻典網. ytenx.org [韻典網]. Rearranged by BYVoid. ↑ "Xiongnu People". britannica.com. Encyclopædia Britannica. Retrieved 25 July 2015. 1 2 Grousset, Rene (1970). The Empire of the Steppes. Rutgers University Press. pp. 19, 26–27. ISBN 978-0-8135-1304-1. 1 2 Harmatta 1994 , p. 488: "Their royal tribes and kings (shan-yii) bore Iranian names and all the Hsiung-nu words noted by the Chinese can be explained from an Iranian language of Saka type. It is therefore clear that the majority of Hsiung-nu tribes spoke an Eastern Iranian language." ↑ Vovin, Alexander. "Did the Xiongnu speak a Yeniseian language?". Central Asiatic Journal 44/1 (2000), pp. 87–104. ↑ 高晶一, Jingyi Gao (2017). 確定夏國及凱特人的語言為屬於漢語族和葉尼塞語系共同詞源[Xia and Ket Identified by Sinitic and Yeniseian Shared Etymologies]. Central Asiatic Journal. 60 (1–2): 51–58. doi:10.13173/centasiaj.60.1-2.0051. JSTOR 10.13173/centasiaj.60.1-2.0051. ↑ Di Cosmo 2002, 2. ↑ Di Cosmo 2002, 129. 1 2 Di Cosmo 2002, 107. ↑ Di Cosmo 1999, 892–893. ↑ Pulleyblank 2000, p. 20. 1 2 Di Cosmo 1999, 892–893 & 964. ↑ Toh 2005, p. 11. ↑ 又《漢書》：“使王烏等窺匈奴。法，漢使不去節，不以墨黥面，不得入穹盧。王烏等去節、黥面，得入穹盧，單於愛之。” from Miscellaneous Morsels from Youyang, Scroll 8 Translation from Reed, Carrie E. (2000). "Tattoo in Early China". Journal of the American Oriental Society. 120 (3): 360–376. doi:10.2307/606008. JSTOR 606008. 1 2 Yü, Ying-shih (1986). "Han Foreign Relations". The Cambridge History of China, Volume 1: The Ch'in and Han Empires, 221 BC – AD 220. Cambridge: Cambridge University Press. p. 384. ISBN 978-0-521-24327-8. 1 2 3 Barfield, Thomas J. (1981). "The Hsiung-nu imperial confederacy: Organization and foreign policy". The Journal of Asian Studies. 41 (1): 45–61. doi:10.2307/2055601. JSTOR 2055601. ↑ Qian Sima; Burton Watson (January 1993). Records of the Grand Historian: Han dynasty. Renditions-Columbia University Press. pp. 161–. ISBN 978-0-231-08166-5. ↑ Monumenta Serica. H. Vetch. 2004. p. 81. ↑ Frederic E. Wakeman (1985). The Great Enterprise: The Manchu Reconstruction of Imperial Order in Seventeenth-century China. University of California Press. pp. 41–. ISBN 978-0-520-04804-1. ↑ Veronika Veit, ed. (2007). The role of women in the Altaic world: Permanent International Altaistic Conference, 44th meeting, Walberberg, 26–31 August 2001. Volume 152 of Asiatische Forschungen (illustrated ed.). Otto Harrassowitz Verlag. p. 61. ISBN 978-3-447-05537-6 . Retrieved 8 February 2012. ↑ Michael Robert Drompp (2005). Tang China and the collapse of the Uighur Empire: a documentary history. Volume 13 of Brill's Inner Asian library (illustrated ed.). BRILL. p. 126. ISBN 978-9004141292 . Retrieved 8 February 2012. ↑ Lin Jianming (林剑鸣) (1992). 秦漢史 [History of Qin and Han]. Wunan Publishing. pp. 557–8. ISBN 978-957-11-0574-1. 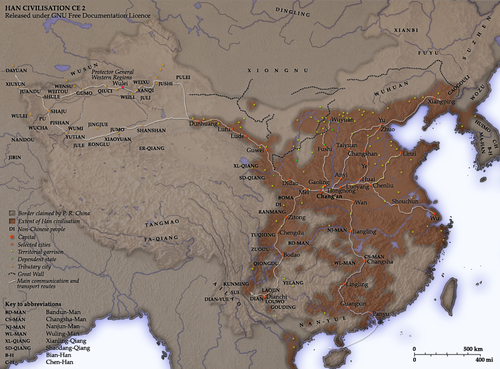 ↑ China: Dawn of a Golden Age, 200–750 AD. Metropolitan Museum of Art. 2004. pp. 18–. ISBN 978-1-58839-126-1. ↑ James A. Millward (2007). Eurasian crossroads: a history of Xinjiang. Columbia University Press. p. 20. ISBN 978-0-231-13924-3 . Retrieved 2011-04-17. ↑ Julia Lovell (2007). The Great Wall: China Against the World, 1000 BC – AD 2000. Grove Press. p. 73. ISBN 978-0-8021-4297-9 . Retrieved 2011-04-17. ↑ Alfred J. Andrea; James H. Overfield (1998). The Human Record: To 1700. Houghton Mifflin. p. 165. ISBN 978-0-395-87087-7 . Retrieved 2011-04-17. ↑ Yiping Zhang (2005). Story of the Silk Road. China Intercontinental Press. p. 22. ISBN 978-7-5085-0832-0 . Retrieved 2011-04-17. ↑ Charles Higham (2004). Encyclopedia of ancient Asian civilizations. Infobase Publishing. p. 409. ISBN 978-0-8160-4640-9 . Retrieved 2011-04-17. ↑ Indian Society for Prehistoric & Quaternary Studies (1998). Man and environment, Volume 23, Issue 1. Indian Society for Prehistoric and Quaternary Studies. p. 6. Retrieved 2011-04-17. ↑ Adrienne Mayor (22 September 2014). The Amazons: Lives and Legends of Warrior Women across the Ancient World. Princeton University Press. pp. 422–. ISBN 978-1-4008-6513-0. ↑ Grousset, Rene (1970). The Empire of the Steppes. Rutgers University Press. p. 34. ISBN 978-0-8135-1304-1. ↑ Han Shu (Beijing: Zhonghua shuju ed) 94B, p. 3824. ↑ Grousset, Rene (1970). The Empire of the Steppes. Rutgers University Press. pp. 42–47. ISBN 978-0-8135-1304-1. ↑ Grousset, Rene (1970). The Empire of the Steppes. Rutgers University Press. pp. 37–38. ISBN 978-0-8135-1304-1. ↑ Fairbank & Têng 1941. ↑ Grousset, Rene (1970). The Empire of the Steppes. Rutgers University Press. p. 39. ISBN 978-0-8135-1304-1. ↑ Grousset, Rene (1970). The Empire of the Steppes. Rutgers University Press. p. 53. ISBN 978-0-8135-1304-1. ↑ Grousset, Rene (1970). The Empire of the Steppes. Rutgers University Press. p. 54. ISBN 978-0-8135-1304-1. ↑ Grousset, Rene (1970). The Empire of the Steppes. Rutgers University Press. pp. 56–57. ISBN 978-0-8135-1304-1. ↑ Grousset, Rene (1970). The Empire of the Steppes. Rutgers University Press. pp. 57–58. ISBN 978-0-8135-1304-1. ↑ Beckwith 2009 , p. 405: "Accordingly, the transcription now read as Hsiung- nu may have been pronounced * Soγdâ, * Soγlâ, * Sak(a)dâ, or even * Skla(C)da, etc." ↑ Denis, Sinor. Aspects of Altaic Civilization III. ↑ Howorth, Henry H. (Henry Hoyle). History of the Mongols from the 9th to the 19th century. London : Longmans, Green – via Internet Archive. ↑ "Sun and Moon" (JPG). depts.washington.edu. ↑ Craig Benjamin (2007, 49), In: Hyun Jin Kim, The Huns, Rome and the Birth of Europe. Cambridge University Press. 2013. page 176. ↑ Du, You (1988). 辺防13 北狄4 突厥上. 《通典》[ Tongdian ] (in Chinese). 197. Beijing: Zhonghua Book Company. p. 5401. ISBN 978-7-101-00258-4. ↑ "Об эт нической принадлежности Хунну". rudocs.exdat.com. ↑ Jenkins, Romilly James Heald (1967). De Administrando Imperio by Constantine VII Porphyrogenitus. Corpus fontium historiae Byzantinae (New, revised ed.). Washington, D.C.: Dumbarton Oaks Center for Byzantine Studies. p. 65. ISBN 978-0-88402-021-9 . Retrieved 28 August 2013. According to Constantine Porphyrogenitus, writing in his De Administrando Imperio (ca. 950 AD) "Patzinakia, the Pecheneg realm, stretches west as far as the Siret River (or even the Eastern Carpathian Mountains), and is four days distant from Tourkia (i.e. Hungary)." ↑ Günter Prinzing; Maciej Salamon (1999). Byzanz und Ostmitteleuropa 950–1453: Beiträge zu einer table-ronde des XIX. International Congress of Byzantine Studies, Copenhagen 1996. Otto Harrassowitz Verlag. p. 46. ISBN 978-3-447-04146-1 . Retrieved 9 February 2013. ↑ Henry Hoyle Howorth (2008). History of the Mongols from the 9th to the 19th Century: The So-called Tartars of Russia and Central Asia. Cosimo, Inc. p. 3. ISBN 978-1-60520-134-4 . Retrieved 15 June 2013. ↑ Peter B. Golden (1992). "Chapter VI – The Uyğur Qağante (742–840)". An Introduction to the History of the Turkic Peoples: Ethnogenesis and State-Formation in Medieval and Early Modern Eurasia and the Middle East. p. 155. ISBN 978-3-447-03274-2. ↑ Nabijan Tursun. "The Formation of Modern Uyghur Historiography and Competing Perspectives toward Uyghur History". The China and Eurasia Forum Quarterly. 6 (3): 87–100. ↑ James A. Millward & Peter C. Perdue (2004). "Chapter 2: Political and Cultural History of the Xinjiang Region through the Late Nineteenth Century". In S. Frederick Starr (ed.). Xinjiang: China's Muslim Borderland. M. E. Sharpe. pp. 40–41. ISBN 978-0-7656-1318-9. ↑ Susan J. Henders (2006). Susan J. Henders (ed.). Democratization and Identity: Regimes and Ethnicity in East and Southeast Asia. Lexington Books. p. 135. ISBN 978-0-7391-0767-6 . Retrieved 2011-09-09. ↑ Reed, J. Todd; Raschke, Diana (2010). The ETIM: China's Islamic Militants and the Global Terrorist Threat. ABC-CLIO. p. 7. ISBN 978-0-313-36540-9. ↑ Honeychurch, William. "Thinking Political Communities: The State and Social Stratification among Ancient Nomads of Mongolia". The Anthropological Study of Class and Consciousness: 47. ↑ "Archaeologist D.Erdenebaatar Эрдэмтэн Д.Эрдэнэбаатар: Хүннүгийн хаадын булш Монголд л бий". ↑ Lebedynsky 2007 , p. 125 "Europoid faces in some depictions of the Ordos, which should be attributed to a Scythian affinity"
↑ Lebedynsky 2007 , p. 125 "The Mongoloid types of the Transbaikal area and Central and Eastern Mongolia are strongly contrasted with the Europoid type displayed at the same time by the Scythian nomads occupying Western Mongolia and their predecessors of the Bronze age." ↑ A. V. Davydova, Ivolginskii arkheologicheskii kompleks II. Ivolginskii mogil’nik. Arkheologicheskie pamiatniki Siunnu 2 (Sankt-Peterburg 1996). А. В. Давыдова, Иволгинский археологи-ческий комплекс II. Иволгинский могильник. Археологические памятники Сюнну 2 (Санкт-Петербург 1996). ↑ S. S. Miniaev, Dyrestuiskii mogil’nik. Arkheologicheskie pamiatniki Siunnu 3 (Sankt-Peterburg 1998). С. С. Миняев, Дырестуйский могильник. Археологические памятники Сюнну 3 (Санкт-Петербург 1998). ↑ Ts. Törbat, Keramika khunnskogo mogil’nika Burkhan-Tolgoi. Erdem shinzhilgeenii bichig. Arkheologi, antropologi, ugsaatan sudlal 19,2003, 82–100. Ц. Тѳрбат, Керамика хуннского могильника Бурхан-Толгой. Эрдэм шинжилгээний бичиг. Археологи, антропологи, угсаатан судлал 19, 2003, 82–100. ↑ Ts. Törbat, Tamiryn Ulaan khoshuuny bulsh ba Khünnügiin ugsaatny büreldekhüünii asuudald. Tükhiin setgüül 4, 2003, 6–17. Ц. Төрбат, Тамирын Улаан хошууны булш ба Хүннүгийн угсаатны бүрэлдэхүүний асуудалд. Түүхийн сэтгүүл 4, 2003, 6–17. ↑ Ningxia Cultural Relics and Archaeology Research Institute (寧夏文物考古研究所); Chinese Academy of Social Sciences Archaeology Institute Ningxia Archaeology Group; Tongxin County Cultural Relics Administration (同心縣文物管理所) (1988). 寧夏同心倒墩子匈奴墓地. 考古學報 [Archaeology Journal] (3): 333–356. ↑ Miller, Bryan (2011). Jan Bemmann (ed.). Xiongnu Archaeology. Bonn: Vor- und Fruhgeschichtliche Archaeologie Rheinische Friedrich-Wilhelms-Universitat Bonn. ISBN 978-3-936490-14-5. ↑ Purcell, David. "Maps of the Xiongnu Cemetery at Tamiryn Ulaan Khoshuu, Ogii nuur, Arkhangai Aimag, Mongolia" (PDF). The Silk Road. 9: 143–145. 1 2 Purcell, David; Kimberly Spurr. "Archaeological Investigations of Xiongnu Sites in the Tamir River Valley" (PDF). The Silk Road. 4 (1): 20–31. 1 2 Lai, Guolong. "The Date of the TLV Mirrors from the Xiongnu Tombs" (PDF). The Silk Road. 4 (1): 34–43. ↑ Miller, Bryan (2011). Jan Bemmann (ed.). Xiongnu Archaeology. Bonn: Vor- und Fruhgeschichtliche Archaologie Rheinische Friedrich-Wilhelms-Universitat Bonn. p. 23. ISBN 978-3-936490-14-5. ↑ Miller, Bryan (2011). Jan Bemmann (ed.). Xiongnu Archaeology. Bonn: Vor- und Fruhgeschichtliche Archaologie Rheinische Friedrich-Wilhelms-Universitat Bonn. p. 24. ISBN 978-3-936490-14-5. ↑ Keyser-Tracqui, Christine; Crubézy, Eric; Ludes, Bertrand (2003). "Nuclear and Mitochondrial DNA Analysis of a 2,000-Year-Old Necropolis in the Egyin Gol Valley of Mongolia". The American Journal of Human Genetics. 73 (2): 247–60. doi:10.1086/377005. PMC 1180365 . PMID 12858290. 1 2 3 4 5 6 7 Psarras, Sophia-Karin (2003). "Han and Xiongnu: A Reexamination of Cultural and Political Relations". Monumenta Serica. 51: 55–236. doi:10.1080/02549948.2003.11731391. JSTOR 40727370. ↑ Cho Gab-je. 騎馬흉노국가 新羅 연구　趙甲濟(月刊朝鮮 편집장)의 심층취재　내 몸속을 흐르는 흉노의 피 (in Korean). Monthly Chosun . Retrieved 2016-09-25. ↑ 김운회 (2005-08-30). 김운회의 '대쥬신을 찾아서' <23> 금관의 나라, 신라” (in Korean). 프레시안. Retrieved 2016-09-25. ↑ 경주 사천왕사(寺) 사천왕상(四天王像) 왜 4개가 아니라 3개일까 (in Korean). 조선일보. 2009-02-27. Archived from the original on 2014-12-30. Retrieved 2016-09-25. ↑ "자료검색>상세_기사 | 국립중앙도서관". www.nl.go.kr. Retrieved 2019-04-15. Ban Gu et al., Book of Han , esp. vol. 94, part 1, part 2. Fan Ye et al., Book of the Later Han , esp. vol. 89. Sima Qian et al., Records of the Grand Historian , esp. vol. 110. Adas, Michael. 2001. Agricultural and Pastoral Societies in Ancient and Classical History, American Historical Association/Temple University Press. Barfield, Thomas. 1989. The Perilous Frontier. Basil Blackwell. Beckwith, Christopher I. (16 March 2009). Empires of the Silk Road: A History of Central Eurasia from the Bronze Age to the Present. Princeton University Press. ISBN 978-0-691-13589-2 . Retrieved 30 May 2015. Brosseder, Ursula, and Bryan Miller. Xiongnu Archaeology: Multidisciplinary Perspectives of the First Steppe Empire in Inner Asia. Bonn: Freiburger Graphische Betriebe- Freiburg, 2011. Csányi, B. et al. 2008. Y-Chromosome Analysis of Ancient Hungarian and Two Modern Hungarian-Speaking Populations from the Carpathian Basin [ dead link ]. Annals of Human Genetics, 2008 March 27, 72(4): 519–534. Davydova, Anthonina. The Ivolga archaeological complex. Part 1. The Ivolga fortress. In: Archaeological sites of the Xiongnu, vol. 1. St Petersburg, 1995. Davydova, Anthonina. The Ivolga archaeological complex. Part 2. The Ivolga cemetery. In: Archaeological sites of the Xiongnu, vol. 2. St Petersburg, 1996. (in Russian) Davydova, Anthonina & Minyaev Sergey. The complex of archaeological sites near Dureny village. In: Archaeological sites of the Xiongnu, vol. 5. St Petersburg, 2003. Davydova, Anthonina & Minyaev Sergey. The Xiongnu Decorative bronzes. In: Archaeological sites of the Xiongnu, vol. 6. St Petersburg, 2003. Di Cosmo, Nicola. 1999. The Northern Frontier in Pre-Imperial China. In: The Cambridge History of Ancient China, edited by Michael Loewe and Edward Shaughnessy. Cambridge University Press. J.K., Fairbank; Têng, S.Y. (1941). "On the Ch'ing Tributary System". Harvard Journal of Asiatic Studies. 6 (2): 135–246. doi:10.2307/2718006. JSTOR 2718006. Genome News Network. 2003 July 25. "Ancient DNA Tells Tales from the Grave"
Grousset, René. 1970. The empire of the steppes: a history of central Asia. Rutgers University Press. (in Russian) Gumilev L. N. 1961. История народа Хунну (History of the Hunnu people). Harmatta, János (1 January 1994). "Conclusion". In Harmatta, János (ed.). History of Civilizations of Central Asia: The Development of Sedentary and Nomadic Civilizations, 700 B. C. to A. D. 250. UNESCO. pp. 485–492. ISBN 978-9231028465 . Retrieved 29 May 2015. (in Hungarian) Helimski, Eugen. "A szamojéd népek vázlatos története" (Short History of the Samoyedic peoples). In: The History of the Finno-Ugric and Samoyedic Peoples. 2000, Eötvös Loránd University, Budapest, Hungary. Henning W. B. 1948. The date of the Sogdian ancient letters. Bulletin of the School of Oriental and African Studies (BSOAS), 12(3–4): 601–615. N. Ishjamts. 1999. Nomads In Eastern Central Asia. In: History of civilizations of Central Asia. Volume 2: The Development of Sedentary and Nomadic Civilizations, 700 bc to ad 250; Edited by Janos Harmatta et al. UNESCO. ISBN 92-3-102846-4. 151–170. Jankowski, Henryk (2006). Historical-Etymological Dictionary of Pre-Russian Habitation Names of the Crimea. Handbuch der Orientalistik [HdO], 8: Central Asia; 15. Brill. ISBN 978-90-04-15433-9. Kradin, Nikolay. 2005. Social and Economic Structure of the Xiongnu of the Trans-Baikal Region. Archaeology, Ethnology & Anthropology of Eurasia, No 1 (21), p. 79–86. Kradin, Nikolay. 2012. New Approaches and Challenges for the Xiongnu Studies. In: Xiongnu and its eastward Neighbours. Seoul, p. 35–51. (in Russian) Kiuner (Kjuner, Küner) [Кюнер], N.V. 1961. Китайские известия о народах Южной Сибири, Центральной Азии и Дальнего Востока (Chinese reports about peoples of Southern Siberia, Central Asia, and Far East). Moscow. (in Russian) Klyashtorny S.G. [Кляшторный С.Г.]. 1964. Древнетюркские рунические памятники как источник по истории Средней Азии. (Ancient Türkic runiform monuments as a source for the history of Central Asia). Moscow: Nauka. (in German) Liu Mau-tsai. 1958. Die chinesischen Nachrichten zur Geschichte der Ost-Türken (T'u-küe). Wiesbaden: Otto Harrassowitz. Loewe, Michael. 1974. The campaigns of Han Wu-ti. In: Chinese ways in warfare, ed. Frank A. Kierman, Jr., and John K. Fairbank. Harvard Univ. Press. Maenschen-Helfen, Otto (1973). The World of the Huns: Studies in Their History and Culture. University of California Press. ISBN 978-0-520-01596-8 . Retrieved February 18, 2015. Minyaev, Sergey. On the origin of the Xiongnu // Bulletin of International association for the study of the culture of Central Asia, UNESCO. Moscow, 1985, No. 9. Minyaev, Sergey. News of Xiongnu Archaeology // Das Altertum, vol. 35. Berlin, 1989. Miniaev, Sergey. "Niche Grave Burials of the Xiong-nu Period in Central Asia", Information Bulletin, Inter-national Association for the Cultures of Central Asia 17(1990): 91–99. Minyaev, Sergey. The excavation of Xiongnu Sites in the Buryatia Republic// Orientations, vol. 26, n. 10, Hong Kong, November 1995. Minyaev, Sergey. Les Xiongnu// Dossiers d' archaeologie, # 212. Paris 1996. Minyaev, Sergey. Archaeologie des Xiongnu en Russie: nouvelles decouvertes et quelques Problemes. In: Arts Asiatiques, tome 51, Paris, 1996. Minyaev, Sergey. The origins of the "Geometric Style" in Hsiungnu art // BAR International series 890. London, 2000. Minyaev, Sergey & Smolarsky Phillipe. Art of the Steppes. Brussels, Foundation Richard Liu, 2002. (in Russian) Minyaev, Sergey. Derestuj cemetery. In: Archaeological sites of the Xiongnu, vol. 3. St-Petersburg, 1998. Miniaev, Sergey & Sakharovskaja, Lidya. Investigation of a Xiongnu Royal Tomb in the Tsaraam valley, part 1. In: Newsletters of the Silk Road Foundation, vol. 4, no.1, 2006. Miniaev, Sergey & Sakharovskaja, Lidya. Investigation of a Xiongnu Royal Tomb in the Tsaraam valley, part 2. In: Newsletters of the Silk Road Foundation, vol. 5, no.1, 2007. (in Russian) Minyaev, Sergey. The Xiongnu cultural complex: location and chronology. In: Ancient and Middle Age History of Eastern Asia. Vladivostok, 2001, pp. 295–305. Miniaev, Sergey & Elikhina, Julia. On the chronology of the Noyon Uul barrows. The Silk Road 7 (2009: 21–30). (in Hungarian) Obrusánszky, Borbála. 2006 October 10. Huns in China (Hunok Kínában) 3. (in Hungarian) Obrusánszky, Borbála. 2009. Tongwancheng, city of the southern Huns. Transoxiana, August 2009, 14. ISSN 1666-7050. (in Russian) Potapov L.P. [ Потапов, Л. П. ] 1969. Этнический состав и происхождение алтайцев (Etnicheskii sostav i proiskhozhdenie altaitsev, Ethnic composition and origins of the Altaians). Leningrad: Nauka. Facsimile in Microsoft Word format. (in German) Pritsak O. 1959. XUN Der Volksname der Hsiung-nu. Central Asiatic Journal, 5: 27–34. Psarras, Sophia-Karin. "HAN AND XIONGNU: A REEXAMINATION OF CULTURAL AND POLITICAL RELATIONS (I)." Monumenta Serica. 51. (2003): 55–236. Web. 12 Dec. 2012. <https://www.jstor.org/stable/40727370>. Pulleyblank, Edwin G. (2000). "Ji 姬 and Jiang 姜: The Role of Exogamic Clans in the Organization of the Zhou Polity" (PDF). Early China. 25 (25): 1–27. doi:10.1017/S0362502800004259. Sims-Williams, Nicholas. 2004. The Sogdian ancient letters. Letters 1, 2, 3, and 5 translated into English. (in Russian) Talko-Gryntsevich, Julian. Paleo-Ethnology of Trans-Baikal area. In: Archaeological sites of the Xiongnu, vol. 4. St Petersburg, 1999. Taskin V.S. [Таскин В.С.]. 1984. Материалы по истории древних кочевых народов группы Дунху (Materials on the history of the ancient nomadic peoples of the Dunhu group). Moscow. Toh, Hoong Teik (2005). "The -yu Ending in Xiongnu, Xianbei, and Gaoju Onomastica" (PDF). Sino-Platonic Papers. 146. (in French) Vaissière (2005). "Huns et Xiongnu". Central Asiatic Journal. 49 (1): 3–26. Vaissière, Étienne de la. 2006. Xiongnu. Encyclopædia Iranica online. Vovin, Alexander (2000). "Did the Xiongnu speak a Yeniseian language?". Central Asiatic Journal. 44 (1): 87–104. Zhang, Bibo (张碧波); Dong, Guoyao (董国尧) (2001). 中国古代北方民族文化史[Cultural History of Ancient Northern Ethnic Groups in China]. Harbin: Heilongjiang People's Press. ISBN 978-7-207-03325-3. (in Russian) Потапов, Л. П. 1966. Этнионим Теле и Алтайцы. Тюркологический сборник, 1966: 233–240. Moscow: Nauka. (Potapov L.P., The ethnonym "Tele" and the Altaians. Turcologica 1966: 233–240). Houle, J. and L.G. Broderick 2011 "Settlement Patterns and Domestic Economy of the Xiongnu in Khanui Valley, Mongolia", 137–152. In Xiongnu Archaeology: Multidisciplinary Perspectives of the First Steppe Empire in Inner Asia. Wikimedia Commons has media related to Xiongnu . Wikisource has the text of the 1911 Encyclopædia Britannica article Hiung-nu . Li, Chunxiang; Li, Hongjie; Cui, Yinqiu; Xie, Chengzhi; Cai, Dawei; Li, Wenying; Victor, Mair H.; Xu, Zhi; Zhang, Quanchao; Abuduresule, Idelisi; Jin, Li; Zhu, Hong; Zhou, Hui (2010). "Evidence that a West-East admixed population lived in the Tarim Basin as early as the early Bronze Age". BMC Biology. 8: 15. doi:10.1186/1741-7007-8-15. PMC 2838831 . PMID 20163704.